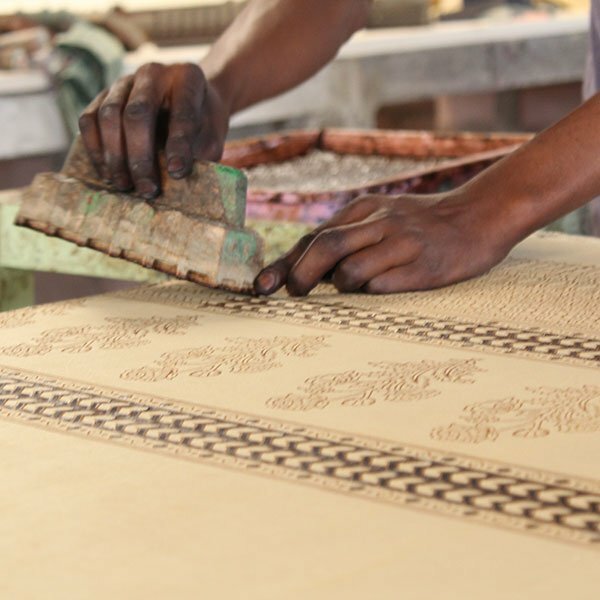 A revered art form native to Rajasthan, India, block printing is a painstaking process mastery of labor-intensive steps that require especially in wood-block carving. Each color gets its own block and intricate designs can take several carvers days to create. Fabric is prepped with a mixture of herbs to make it absorbent for natural dyes extracted from plants, minerals, and flowers. Artisans press the carved wood block with wet dye onto fabric and reapply at precise spots for pattern continuation. When the pattern is complete, the printed fabric is washed or boiled for the final color to emerge. The color changes throughout the process. Shade variations can be dramatic depending on a fabric’s exposure to sunlight while drying. Due to their limited production batches, every piece has a distinctively handmade, unique, and rich feel. Our block print artisan partners live in scattered rural villages that are challenged by poverty and lack of infrastructure in their isolated communities. There are few opportunities for jobs in this desert region, where the climate is too dry for agriculture. We partner with organizations that focus on economic, social, and environmental development for these communities, providing assistance such as solar power, education, and health care. At Just Creations, you’ll find block printing on table linens, bags, pot holders, and even some of our journals.